Cleaning usually isn't much fun, but necessary. Many pets have a tendency to get both themselves and their humans into sticky messes, and when out and about, clean water can be a rare commodity. The PushClean towelettes caught my eyes at the Global Pet Expo, presenting an elegant solution to the problem. 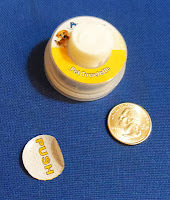 The PushClean is a small container, just a little larger than a quarter. It's both sturdy and small enough to fit in a purse or even a pocket. When I opened my first one, I pushed where it says "push" and not much happened. The towelette is separated from the liquid inside the container, so one has to push pretty hard. Then, magic! 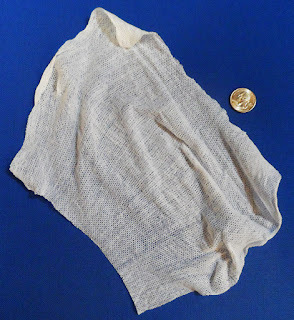 It's always fun when something happens, and seeing the towelette grow is... fun. The finished product is thin but fairly big, and sturdy. I've been trying to rip it, and it doesn't tear. It's made from bamboo, and smells good. To make things even better, the towelettes are biodegradable. The manufacturer says bamboo is the fastest growing plant on the planet, and can produce 35% more oxygen than trees. They can be purchased directly from the manufacturer at a reasonable price, and can be private labelled for resellers. 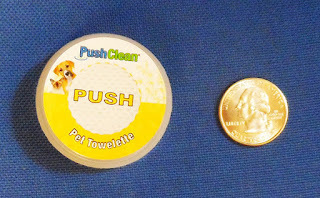 I don't know if I personally would use it all that much for my pets - my dogs are pretty clean and if they get into a mess it will be bigger than I could handle with a towelette - but I can think of at least a dozen other uses. I like that the product is so easy to bring and fits in my purse.